The Timor Figbirds (Sphecotheres viridis) - also known as Green Figbirds - occur naturally in Indonesia and East Timor (for which they were named). 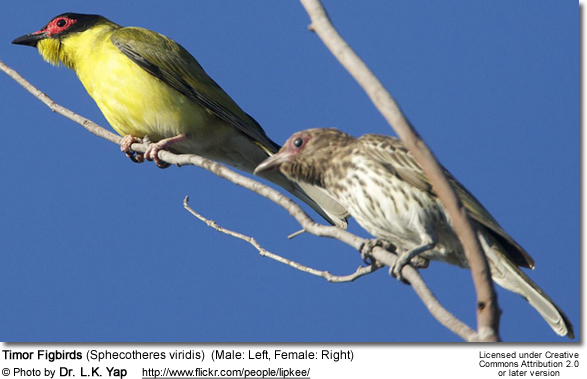 Some authorities include two other figbird species - the Wetar Figbird (Sphecotheres hypoleucus) and the Australasian Figbird (Sphecotheres vieilloti) - as subspecies. Further research is required to resolve its taxonomy. Timor Figbirds are endemic to the south-east Asian islands of Timor and Roti, in Lesser Sundas, where they are moderately common. Outside the breeding season, they travel in flocks, foraging for food in the trees. The flocks are large, containing as many as 20 birds. They occur naturally in forests, woodlands, and scrublands; and they can frequently be seen in urban parks and gardens, especially if those areas contain fig trees and other fruit-producing trees. Often they are observed in mangroves—tropical evergreen trees on tidal coasts. They will inhabit orchards, watercourses, parks and gardens which include leafy trees and berry-producing plants. A medium-sized bird, the Figbird is usually observed in its range and in protected areas. They are highly sexually dimorphic (males and females can easily be visually identified). Males have bare, bright red facial skin around the eye, which contrasts against a black crown. The back is olive-green and the plumage below (throat, chest and belly) are yellow-olive. Females are plain-colored, with brown and white, heavily dark-streaked bodies. The upper plumage is brown green and the plumage below is off-white with brown streaking. There are no distinctive head markings, except for the grey facial skin. The bill is greyish-black with a red base. The legs are flesh-colored. Juveniles look like females, but the streaking below is generally not as bold. The Timor Figbird resembles the widespread Australasian Figbird, except for the smaller size and has paler crissum feathers (the feathers surrounding the cloaca of a bird). Figs are a particularly popular food item (as suggested by their common name), although they will feed on most soft fruits and native berries in canopy trees. They consume Insects also.